To Dog With Love: How to Make Your Living Space Pet-friendly and Stylish! How to Make Your Living Space Pet-friendly and Stylish! Whether you're moving to a new place with a pet or bringing a new furry addition into your home, a little advance planning can go a long way in making your living space a happy place for both you and your pet. That's why we are really excited to partner with Apartment Guide to bring you some tips on moving as well as some things to know when you are bringing a new pet into your apartment. Since I've had dogs, I've lived in apartments, condos and houses, and each time I moved I had a few tricks of my own to make the move more pleasant and the new surroundings more comfortable. So I'm going to share a few tips from Apartment Guide as well as a few of my own! Since I've had Cosmo, we've moved twice -- from a condo, to an apartment, to our current house. For us, the apartment was a temporary solution since I was lucky enough to sell a condo a little too quickly and we had nowhere else to go! If you happen to find yourself in a similar situation with a pet, Apartment Guide has the photos, floor plans, features and tips to help you search for the perfect pet-friendly apartment community. When we lived in the apartment, I loved the pet friendly walking areas as well as some unexpected extras like the pet-friendly window sills! Cosmo loved this built-in perch in our apartment! 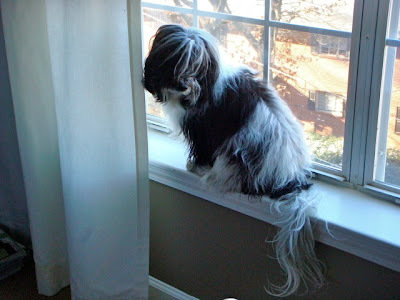 One tip: If your pet likes to jump up on the window sill, please make sure the windows are secure and closed! The third floor provided a great viewing area for Cosmo, but I wanted to make sure he stayed INSIDE the apartment! Here are a few more things we've done to make our living space more pet-friendly and pet-welcoming! If your pet likes to join you in bed, consider a bench at the foot of the bed (like the one above) to make the leap a little less strenuous. 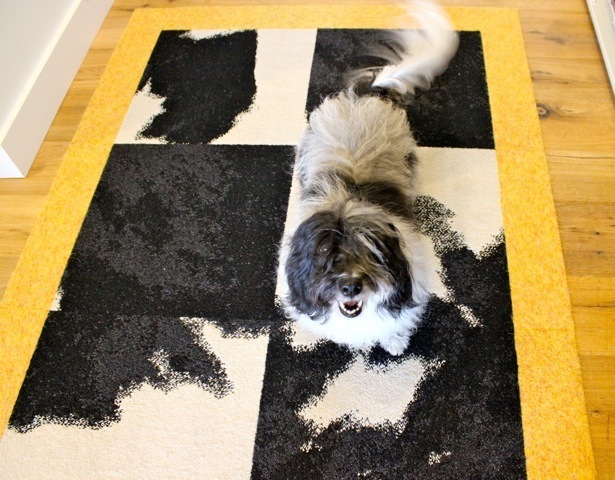 An area rug will also provide your pet with some traction and will help dampen the sound of clicking feet across the bedroom floor! I got the bench, above, and the pet bed from Mitchell Gold + Bob Williams. 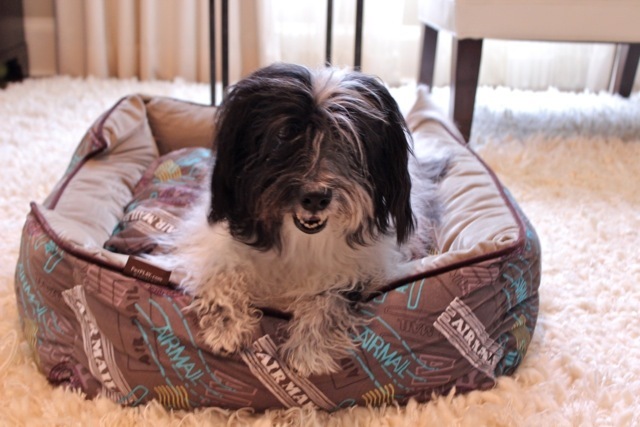 I was able to customize both with complementary pet-friendly fabrics that are both durable AND stylish! Speaking of pet beds, I don't think you can ever have too many! For an affordable option with a customized look, I love this bed, above, from P.L.A.Y. The beds are made with furniture grade fabrics, sustainable materials and are completely machine washable and dryable. The beds are even reversible to give you several looks AND you can order pillows in complementary fabrics for your own bed or sofa! Whether we are traveling across country or moving to a new space, Cosmo doesn't go anywhere without his Big Green Bone, above. I always make sure Cosmo's favorite toys and treats are close at hand. And if you're moving, be sure you have quick access to your pet's food and bowls too! When it comes to flooring, I love the options and functionality of carpet tiles. These, above, are from FLOR. You can customize the look to fit your own style and if your pet has an accident, it's super easy to clean one tile or even replace it. 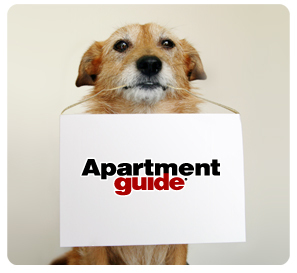 The folks at Apartment Guide also provide lots of helpful suggestions for moving to and exploring a new neighborhood with your pet. Whether you are living, looking or moving, Apartment Guide will point you in the right direction. For more, "Like” Apartment Guide on Facebook, tweet at them @AptGuide on Twitter, “circle” them on Google+ and follow them on Pinterest for real-time tips and updates on how to make the most of your small space. Stop back by To Dog With Love on Friday, and we'll be hosting a giveaway for a $50 gift card from PetSmart, courtesy of Apartment Guide! You could pick up a snappy new bed, some Bissell pet clean-up products, or a Halloween welcome rug -- all essentials in my book for a stylish, pet-friendly home! You live beautifully. :) I love this post. Hey, we love the carpet tile idea! And we have the same bench concept going on (now to break Faraday of the habit of sharpening his NAILS on it!). great post! you are right that one can never have enough beds. i have one in almost every room of the house. we dogs rule the world and especially living spaces. my sister lab has lived only in apartments and the big city. she is quite adapted to small space living and yet, she even has a little fenced garden place of her own! Her mom has it all down pat after SO many moves. Good info Cosmo! Looks like you have it made in the shade! I second the recommendation of FLOR carpet tiles. I've had them for years and they look as good as they did the first day we put them down. love your bedroom but my dog absolutely REFUSES to use a bed! Your home is lovely! Baby won't use a bed either, but she does love her crate at night. :) Great tips! 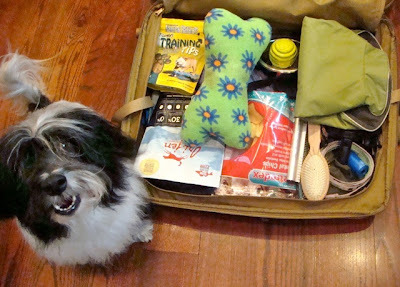 The author has provided very nice tips for all the pet owners who face difficulties while shifting to a new place. The pets will be more comfortable if the living space is pet friendly. I could really use your tips! This is great in my makati apartment for rent. A great way to start up and stuck newly bought furniture after I buy residential property of my own! Now I need to stand alone (for the meantime). I had fun reading this post. Very informative as well. I didn’t know the procedure can be easy. your blog is very nice. These sound like great ideas for a pet owner like me. I guess I have to scour for some small benches to help my pooch along when she starts jumping on the bed for nap-time.